Why in the world would any fly angler even consider pursuing a musky on the fly rod? That is a very good question and one that can be answered very simply. 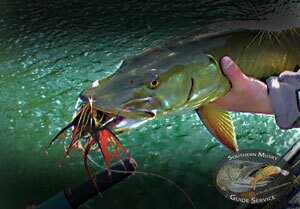 A musky is a "sucker" for a well-presented fly, and we are all "suckers" for a challenge, right? Sounds simple doesn't it? Well, this is musky fishing, and there is nothing simple about these crazy fish. 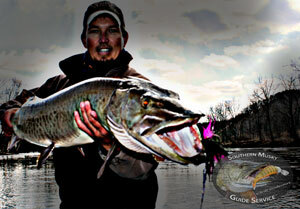 Britt has put in countless hours pursuing Southern Muskies on the Fly on both the New and James Rivers, and if you have the chops, the ambition, and live for the hunt, a Southern Musky on the Fly is a true reality for you here at SMGS. Southern Musky Guide Service is fortunate to have two world-class musky rivers within an hour of each other, the New and James Rivers. We utilize both rivers for all of our guided musky fly fishing trips and have found that it is a huge advantage for us and our clients to have these resources so close to us. With constantly changing river levels on top of all the other variables already associated with hunting muskies, we fish these two rivers interchangeably to try and stay on top of the best bite possible at all times. We call the New River the "Grand Mama" because she is old, real old, with lots of attitude. In fact, most resources point to the fact that the river is the second oldest in the world. And there is no doubt, this big, wide river seems to spit out even older muskies. 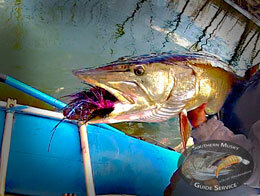 With extensive structure and depth throughout, muskies can, and will, live just about anywhere. There is no doubt when you are pursuing musky on the fly on the New River, you HAVE to know where they hang out or you'll be in for a long day. 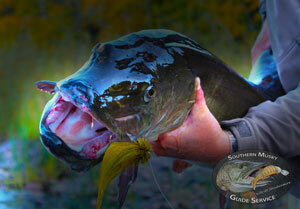 The New can be tougher to fish than the James, but the rewards are great when it comes together. The James is a completely different river than the New and fishes more like a traditional smallmouth stream with cobble riffles at the beginning and ends of long, outside bends in the river. We target these deeper holes, but because of the depth of these pools, fish move around often. Again, understanding where they hang out is hugely important. 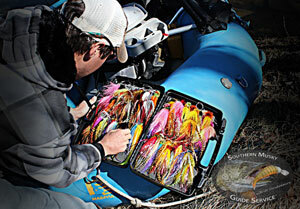 If you are coming to chase muskies on the fly with SMGS, you need tokeep several things in mind. One, we suggest the winter months of December, January, February, and early-March as the peak trophy period, with the post-spawn months of May/June as a close second. We fish long, hard days, and it is cold in the winter period. You need to be in excellent physical and mental shape and be a proficient caster with a 10-wt to cast big, articulated flies all day long. A lot goes into getting a musky to bite and then landing him, some of the techniques we will teach you on your trip, but it starts with the distance and accuracy of your casts. Practice often! Gear list: 10 or 11-wt rod (G.Loomis NRX 10810-4 G), 200g to 450g sinking head line (Scientific Angler Wet Tip Express), larger arbor reel (Ross Reels CLA#5), 60lb to 80lb fluorocarbon leader (Froghair's 60lb to 80lb), BIG flies (see pics for custom, articulated flies). If you are ready to step up to challenge and take on the Southern Musky on the Fly, then give Southern Musky Guide Service a call or email. We'd love to chat with you and get you set up for a trip of a lifetime!